On December 10, 2018 @ 6pm in Heritage Hall at the HUB-Robeson Center, Community Narratives in Focus in collaboration with the College of Education's Diversity and Community Enhancement Committee (DCEC) will screen the film, "Schooling Narratives". The 19-minute mini-documentary features the schooling experiences of three families in the State College Area School District. Listen to students, a mother, a grandmother, and community activist discuss their struggles with racism, as well as their aspirations for the local district in educating students from diverse backgrounds. The screening will be followed by a panel discussion featuring current and past parents of SCASD. The panel will be moderated Wideline Seraphin and Ana Carolina Díaz Beltrán. This screening is an opportunity to support families of color and play an active role in their push for educational equity in our local schools. If you have any questions or concerns, feel free to contact Wideline (wideline@psu.edu) or Ana (diazbeltran@psu.edu). The College of Education’s 2018 Staff Retreat was held on May 18, 2018 at the Bryce Jordan Center Founder’s Lounge. The annual Retreat was sponsored by the College’s Diversity and Community Enhancement Committee (DCEC). The facilitator of this year’s Retreat was Shaver’s Creek Team Development Center. Attendees enjoyed a day filled with community and team-building activities highlighting focus on the Native American Medicine Wheel. The attendees self-identified to either their East, West, North, or South dominant personality trait from the Wheel and then how to work best with others from different directions on the Wheel. This event was help on April 30th, 2018, from 10:00 a.m. to 12:00 p.m. in the Chambers Building. As part of PSU's mission of establishing a culturally diverse and mutually supportive environment, the DCEC hosted a 2 hour Safe Zone training for the College of Education faculty, staff, and graduate students. The Safe Zone program is a campus wide initiative designed to raise visibility about the lesbian, gay, bisexual, transgender, queer and questioning (LGBTQ) population. 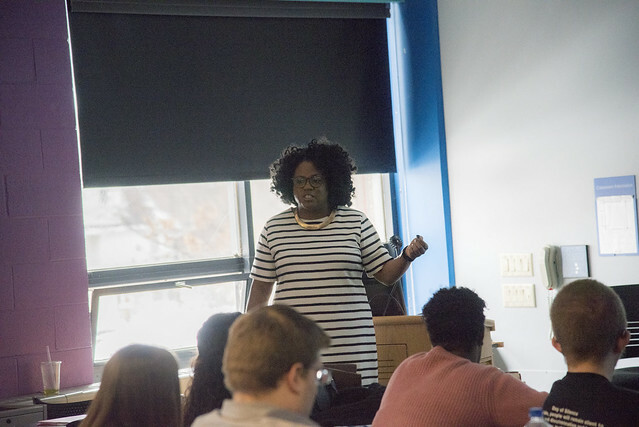 Participants of the Safe Zone training developed awareness of LGBTQ issues and learned how to support LGBTQ students and help students find campus or local resources. Individuals who complete this training can choose to display a Safe Zone sticker in their work environment and will be included in a campus directory of individuals who have completed the training. This event was help on April 23rd, 2018, from 1:00 p.m. to 4:00 p.m. in the Chambers Building. This workshop allowed participants to share ideas, learn new strategies for one-on-one and classroom interaction, and become familiar with a range of support resources on campus for international students. Co-sponsored by EPPIC and Paterno/Pattee Libraries. The DCEC meet and great event was help on April 23rd, 2018, from 11:00am - 1:00pm at the Multicultural Studies Office. This event was held on March 30th, 2018, from 9:00 a.m. to 12 p.m., in the Chambers Building. Participants worked together to define bias, prejudice, and discrimination, and had opportunities to practice intervening in a variety of scenarios. Dr. Seria Chatters from Counseling Education and Betsy VanNoy from Stand for State facilitated the workshop. This event was held on February 10th, 2018, from 8:30 a.m. to 1:00 p.m. in the Chambers Building. JT Taylor and the Penn State Student Council for Exceptional Children were instrumental in organizing this event which was attended by over 60 undergraduate and graduate students and faculty members. This conference is designed to provide a forum for discussion and learning about working with diverse populations of students, teachers, counselors, and administrators. This workshop was held on January 27th, 2018, from 9 a.m. to 4 p.m. at the Nittany Lion Inn. Seria Chatters and Carlos Zalaqett facilitated this workshop. A total of 55 undergraduate students, graduate students, faculty, and community members attended the workshop. 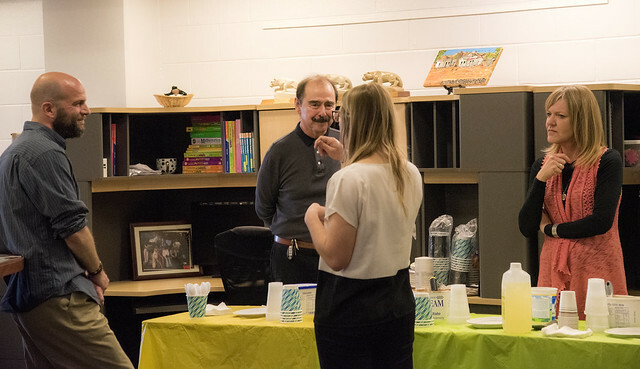 The DCEC meet and greet event was held on a cold December morning that provided coffee, hot chocolate, and donuts to graduate students, staff, and faculty members in the College of Education. The information about the DCEC was distributed and discussed during the event. This DCEC meet and greet event was facilitated by Linda Oishi and others. This event was facilitated by Maria Alicia and was held on December 1st, 2018, from 5 p.m. to 6 p.m at the Kern Building. Over 150 people joined Penn State's own Latin American Folk Music Group Los Tikis in celebrating the life and music of this important folklorist and social activist. 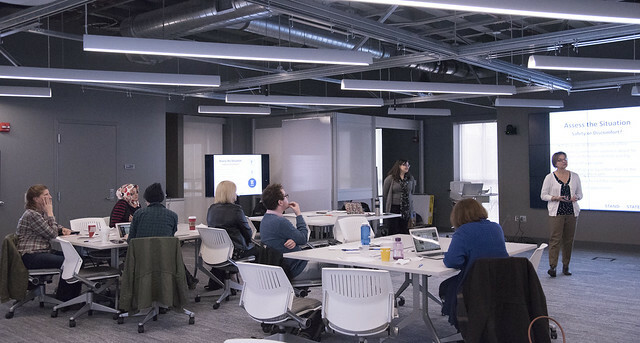 This event was held on November 10th, 2017, from 9 a.m. to 12 p.m. at the Kraus Innovation Studio and was facilitated by Betsy VanNoy, the program director of Ctr for Character, Conscience and Public Purpose. Stand for State is Penn State’s bystander intervention program focusing on sexual and relationship violence, mental health concerns, acts of bias, and risky drinking and drug use. The workshop was held on September 22nd, 2017, from 9 a.m. to 4 p.m. in the Nittany Lion Inn. This event was facilitated by Dr. Seria Chatters and Dr. Carlos Zalaquett. There were over 70 attendees. Today, the news cycle is filled with events documenting racism, various acts of hate, bullying, and harassment. Charlottesville was a recent event; however, acts of hate have increased across the country. These larger events are usually easy to identify and label as an act of hate. However, smaller acts occur on a daily basis in community settings including schools, college campuses, employment settings, and the community at large and are typically more difficult to recognize. In this workshop, participants will learn about the prevalence and impact of bias based bullying and how to begin the journey of identifying and recognizing their own bias. Additionally, participants will learn methods to address bias bullying as an active bystander, a colleague, a friend, and most of all, an educator. Sign up by clicking on the link below. The 2nd annual staff retreat was help on May 19th, 2017, from 8:30 a.m. –4:00 p.m. at the BJC Founders Lounge. There were 32 College staff in attendance. Charleon Jefferies and Peggy Lorah were the facilitators of the presentations surrounding community building and diversity awareness. The Safe Zone for LGBTQ training was held on March 31st, 2017, from 9:00-12:00 p.m. The Safe Zone program (offered by the LGBTQA Student Resource Center) is a campus wide initiative designed to raise visibility about the lesbian, gay, bisexual, transgender, queer and questioning (LGBTQ) population. The training was offered for staff and faculty of the College of Education and attracted 19 attendees. This event was held on February 17, 2017, at the All Sports Museum. 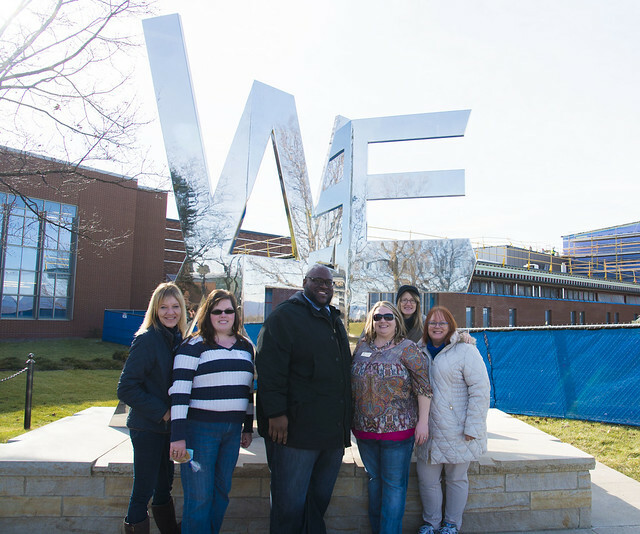 This staff ‘Unity Day’ was a College of Education community building event for staff which included a tour of the PSU All Sport Museum, a showing of the video chronicling the creation of the iconic ‘We Are’, and was followed by a facilitated discussed on inclusion and diversity. It used the "We Are" video as a starting place to encourage participants to embrace the ‘We Are’ theme of PSU. The event was attended by 33 staff and was enjoyed by all. The Diversity in Education 2017 Conference was held on February 11, 2017, 9:00-1:30 p.m., at the Chambers Building. Dr. J. T. Taylor guided the organization of this conference which was student-initiated and organized by the student members of the Penn State Student Council for Exceptional Children. Sessions were offered by graduate students and faculty of the College of Education and the conference was attended by over 100 undergraduate students. The 2017 Bullying Among Diverse Populations Workshop was help on January 28, 2017, from 9 a.m. to 4:30 p.m., at the Pasquerilla Spiritual Center. Dr. Seria Chatters and Dr. Carlos Zalaquett led this full-day workshop for undergraduate students and staff on bias-based bullying with the collaboration of faculty and graduate students from Counseling Education. This series presented films and speakers that highlight loss, struggle, and transformation of young people in diverse cultural context — Ecuador, Guatemala, and the U.S., offering both a global and cultural perspective on a changing world. The film and speakers offered the opportunity of dialogue to emphasize that we can each be who we are together, and advance the ‘All In at Penn State: A Commitment to Diversity and Inclusion’ initiative. Film Screening and Q & A by filmmakers Isabel Rodas & Gabriel Páez. This event was held on October 24th, 2016, at the Foster Auditorium. The film was written, filmed, and produced by young people in Ecuador. It highlights Ecuadorian adolescents’ contemporary concerns, including the conflicts and paradoxes arising from emigration of family members for work abroad. Here is a link to the film website. This event was held on Thursday October 27th, 2016, at the Foster Auditorium. The panel was be an opportunity to dialogue about current immigration policies and the likely consequences of either a Trump or Clinton immigration plan. The panel included experts on immigration law, Shoba Sivaprasad Wadhia and Victor Romero, from Penn State Law and the Center for Immigrants’ Rights, as well as students Ramon Guzman and Stacy Justo and PSU staff member Gary Smith offered their personal lived experience as immigrants. Please see the Collegian article for more information on this event. This event was held on November 16th, 2016, at the Foster Auditorium. A survivor of a genocidal scotched-earth war as a child, Juana Pérez Gómez, a Maya K’ich’e indigenous woman, will describe her work as a middle-school educator emphasizing social justice, gender equality, and the importance of the preservation of the Maya K’ich’e culture and language and the historical memory of her people. DCEC held a series of interactive diversity education workshops. These workshops were given in response to a faculty survey on diversity conducted by the DCEC during the 2012-2013 academic year. The results of that survey indicated faculty's desire to better understand how to facilitate and mediate classroom conversations pertaining to underrepresented perspectives, experiences, and minority identities. We extended this opportunity to graduate teaching assistants who share similar concerns. Three of the four workshops were facilitated by Dr. Reginald Nettles, a licensed psychologist and psychotherapist who specializes in diversity awareness and inclusion in workplaces. One workshop, co-sponsored with the Curriculum & Instruction Graduate Student Association (CIGSA), was facilitated by Dr. William Ayers, Distinguished Professor of Education and Senior University Scholar at the University of Illinois at Chicago (now retired). In February 2009, the DCEC brought Bank Street educator and gay writer/activist Jonathan Silin to the College of Education. Dr. Silin is a skilled facilitator of discussions about LGBT issues for diverse audiences. He hosted two events during his time here, including a panel discussion that brought together two State College teachers, a preschool direct, a lesbian parent of school-aged children and a gay college student who had attended State College schools, for a discussion of LGBT issues in K-12 education. Dr. Silin also hosted a lunch event for further discussion of these issues. If you are interested in learning more about the past annual themes, please go to the following links.